From the savory (sausage races in Milwaukee) to the stately (presidents in D.C.) to the strange (Taco Bell hot sauce packets in Houston), these hallmarks of baseball stadiums are leaving experts scratching their heads. Some of the nation’s foremost experts on sports fandom are left scratching their thinking caps. Even the man partially responsible for creating the phenomenon is puzzled. Warning: You are about to be disappointed. For the past seven years, Michael Ferguson, the Mariners’ manager of game entertainment, has played baseball God, picking which hydro — green, yellow or red — will win that day’s race. So how does he decide? The Mariners have been racing hydros during games since 1991. They have 24 different hydro races to choose from and add to that list each offseason, varying which hydro takes or gives up the lead and adding things like ramps at the finish line. Ferguson makes his pick each morning so the game-day production crew can get the right race and result ready. Which raises the next question: If he picks so early in the day, does he ever conduct any insider trading? He lets the thought float, because what is there to say? People go crazy for those races in between innings at baseball games. 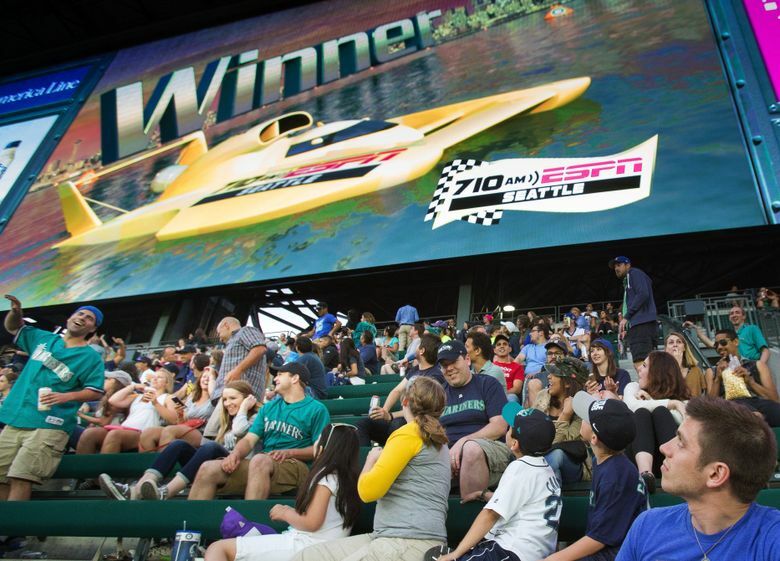 The hydro races at Mariners games are so popular that team employees can’t kill them. From the savory (pierogi races in Pittsburgh and sausage races in Milwaukee) to the stately (presidents in D.C.) to the strange (Taco Bell hot sauce packets in Houston), these hallmarks of baseball stadiums challenge vocal cords. In the land of $11 seats and cold Rainiers — a place otherwise known as the center-field bleachers — I found a spot directly underneath the scoreboard a couple weeks ago, meaning that by the time the hydros roared in the sixth inning, I couldn’t see the screen. All I could do was watch people watching the race. Not to be too scientific about it, but people were acting like complete banshees. Children were standing and screaming. Grown men were standing and screaming. The whole stadium, it seemed, was standing and screaming. It was like looking through glass at the zoo. In the interest of full disclosure, I should mention that I have been there, that deranged fan standing on a seat or high-kneeing down the row if my pick of ketchup, mustard or relish won (that’s what they race in Kansas City). And yet I never thought about the absurdity of it — or why we get more excited for those races than we sometimes do for the game. So I set out to find the answers to two questions: 1) What’s the origin of these races? And 2) What spell have they cast on us to send otherwise fine people into hysteria? It is hard to know exactly when these races formed, but a good place to start is in Texas in the mid-1980s. That’s when Chuck Morgan, the Rangers’ longtime PA announcer, promoted the dot races he’d seen at minor-league stadiums to the big leagues. Morgan spent a month building a racing track out of model railroad grass and cinnamon, pointed a camera at it and projected it onto the screen inside the stadium. Electronic dots raced around the image of the cinnamon track, to thunderous reception. That was 1986, and the next year the Oakland A’s did what any good and noble team does after admiring an idea: They stole it. At the 1987 All-Star Game in Oakland, The Miami Herald dryly noted that the game’s loudest cheers were for: 1) A’s rookie Mark McGwire; 2) The dot races; and 3) The replay of the dot races. “Honest,” the paper wrote. From there, the races only grew more ambitious — the Mariners raced animated sailboats in the late ’80s before adopting hydros in 1991, and the Brewers introduced their famous sausages around the same time. Ever since, critics have been trying to DQ Chuck Morgan’s racing Frankenstein. In 1992, the Ottawa Citizen in Canada noted that 45,000 people at a Blue Jays game “chatted amiably” and “buzzed quietly” until the cartoon airplanes started racing, at which point people lost it. “It was depressing,” the paper wrote. What’s funny is Morgan is the most unlikely pioneer in the distractification (stay with me) of sport. Morgan is a proud old-school baseball man, the kind who believes the players and the game matter most. In fact, sometime in the late ’80s, the marketing team in Oakland decided to go all retro and hold a silent inning, harkening back to a simpler, gentler time. By 1997, Morgan’s dot races had become so much a part of the Rangers’ culture that The Dallas Morning News wrote an ode to their popularity. One reader sent an email informing me that since he started going to Mariners games in the late ’90s, he’s been rooting for the yellow hydro and only the yellow hydro. So part of our obsession is expectation: We are Pavlov’s dogs, eagerly awaiting our sixth-inning reward. • We have to pick a side. Daniel Wann, the Murray State psychology professor, said we have an almost primal desire to pick sides. We can’t help ourselves. • The stakes are stake-less. Though there isn’t a payoff for picking the right hydro other than the obvious payoff of gloating obnoxiously, there also isn’t any cost when our boat loses. • We are products of our environment, and the environment at games is competitive. Wann puts it this way: You know how you watch a scary movie and then walk to your car at night on edge? That’s the same effect happening at games. The environment is a Petri dish for boorishness. • Hey, maybe it’s actually good for us! Adam Earnheardt, the author of a book on “fandemonium,” talks about this thing called euphoric stress, which can be problematic in high doses but healthy in small amounts. So when we’re yelling and screaming during the 30-second races, he says it actually might be good for our hearts, our cardiovascular systems and our emotional well-being in some small way. Every once in a while, believe it or not, those pesky races can even serve a practical, if unusual, purpose.